Slightly off topic for a London forum but I thought some people might like to see this programme by the old Tyne and Wear PTE. It tracks the development, construction and opening of the Tyne and Wear Metro system. 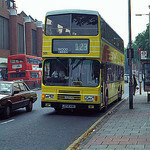 There are some nice bus clips including a MCW Metrobus that later turned up in London service. If you watch closely you'll also see D78 tube trains being built. Needless to say the programme has loads of memories for me as I lived close to the control centre and got inside it a few times. I also drove Metrocars over much of the system during the testing phases - would never happen today! There are also other staff members there who I recognise including one of the bus planners who I worked with at the PTE. It's also rather evocative of a different time when construction work was not hoarded off from everyone and perhaps things were more "innocent" and less stressed.